During the past 20 years, digital map technology has made it much easier for everybody to find and view geographic information on mobile devices and computers. Geoinformation is now an essential business tool for companies involved in geomarketing, mobile network development, as well as urban and regional planning. 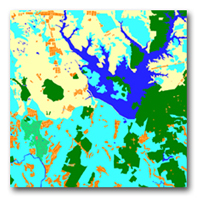 Please contact ISC for advice and specific business proposals concerning the use of the different types of digital map data described in the topic list below. 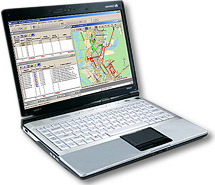 Geoinformation systems require data on specific geographic areas and on the objects and features located in the area. The relevant datasets may include geographic data of different scales for cities, regions and countries, combined with databases of addresses and streets, city infrastructure, and Points Of Interest (POI). 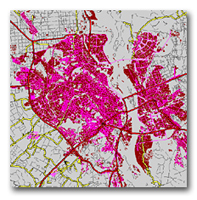 Digital mapping products for cities are available in resolutions from 100m down to below 1m. City model datasets consists of up-to-date, accurate terrain (DTM/DEM), clutter, vectors, text labels, orthoimagery. The sources for city models may be topographic maps (scale 1:10'000 or 1:25'000) or satellite images such as IRS, SPOT with 5-6 m resolution, IKONOS or QuickBird with 1 m resolution (for densely populated areas. Digital models can be supplied for planning of city and urban wireless networks, optimized for such technologies as GSM, CDMA, UMTS/WCDMA, WiMAX, 3G, 4G, LTE. Customized solutions are provided on a turn-key basis, but already many off-the-shelf products are available for a wide range of locations around the world. Regional model datasets consist of terrain (DTM), clutter, vectors, text labels, orthoimagery. Regional models are ideal for planning in large areas of a country. 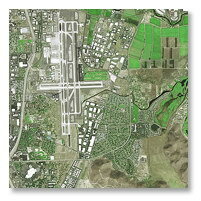 Recent satellite images are used for a variety of tasks, e.g. digital models preparation and updating. Depending on the type of model and required model resolution, the following satellite images may be applied: Landsat7 - Aster - IRS 1C, 1D, P6, P5 (Cartosat 1) - SPOT 2, 4, 5 - Alos - EROS A,B - OrbView 3 - IKONOS - QuickBird 2 - WorldView1 - GeoEye 1. 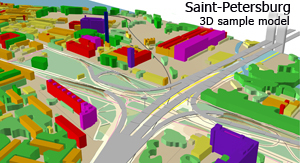 Microplanning of cities requires three dimensional (3D) model including data on all above-ground features and city infrastructure such as buildings, bridges, vegetation. Such geoinformation solutions are ideal for network planning and optimization in dense city areas and city centres. A variety of data options are available for 3D models adapted to different project scopes and budgets. The data sources for city plans of scale 1:10'000 may be satellite images such as EROS B, OrbView 3, QuickBird 2, Ikonos, WorldView 1, GeoEye 1 with 0.5-1 m resolution. The building and vegetation outlines and heights Building Heights Model is based on information about number of buildings floors. Stereo models require city plans of scale 1:10 000 or better, and Ground Control Points collected by precise GPS-receivers. Stereo pairs of satellite images may be provided by EROS B, Ikonos, WorldView 1, GeoEye 1 with 0.5-1 m resolution or airphotos.The heights of city buildings in city and vegetative cover may be determined on the basis of processing of stereo pairs. 3D models may be prepared in any RF- planning system format. Please contact ISC for advice and specific business proposals.